Automechanics are engaged in various automobile repairs and services including autobody and radiator repairs, welding, spray painting, and automobile battery recycling among others. Similar to other professions, these artisans also encounter certain hazards which adversely affect their health. These groups of workers are engaged in the informal sector without access to any structured occupational health programs such as pre-employment or periodic medical screening, enlightenment, or awareness campaigns to protect and promote health at workplaces and may have little or no knowledge of the health hazards inherent in their job. These workers are exposed to various toxic chemicals including lead (Pb) and polycyclic aromatic hydrocarbons which could be absorbed into the body through direct skin contact, ingestion, or inhalation. Lead is a heavy metal which is toxic and ubiquitous in nature, and it is regarded as nonessential as it plays no role in the biological system but rather adversely affects various organs in the body in both children and adults. Regrettably, in many developing countries, Nigeria inclusive, occupational exposure to lead is absolutely unregulated and most time unmonitored, which may account for increased occupational exposure to this toxic metal. In the automechanic workshops, sources of lead include use of leaded gasoline, automobile batteries, radiators, scrap metals, exhaust fumes, and paints. As mentioned earlier, most of these workers are oblivious of the hazards they are exposed to, probably due to illiteracy or lack of awareness programs, and therefore pay little or no attention in protecting themselves from possible ingestion or inhalation of these toxic substances. Apart from not making use of personal protective equipment, they also engage in some unhealthy practices such as sucking of gasoline and washing their hands with the same, a significant source of exposure. The adverse health effects of lead include hypertension, cardiovascular diseases, renal failure, liver damage, cancer, and so on. Lead may affect blood pressure directly or indirectly, and it has also been shown to alter lipid metabolism in both human and animal studies., The alterations in lipid and lipoproteins may contribute to the development and progression of atherosclerosis and cardiovascular diseases. Studies have also reported that exposure to lead induces dyslipidemia, thereby resulting in the accumulation of lipids in the walls of blood vessels. Various studies have shown that lead exposure adversely affects the liver, kidney, heart, and other organs; however, lead exposure in relation to blood pressure as well as lipid and lipoproteins remains controversial. This study therefore aims to assess the blood pressure and lipid profile in automechanics in relation to lead exposure. A total of 120 male subjects between 18 and 55 years of age comprised 60 automechanics and 60 age-matched occupationally unexposed control subjects in Emene, Enugu State, Nigeria, were recruited for the study. The details of the study were explained to each subject, and informed consent was obtained before commencement of the study. Male subjects between 18 and 55 years of age who gave their consent were recruited for the study. Subjects with any history of diabetes, hypertension, cardiovascular disorder, or on antihypertensive or lipid-lowering drugs were excluded from the study. Ethical approval for this study was obtained from Nnamdi Azikiwe University Teaching Hospital Research Ethics Committee (NAUTHREC). The systolic and diastolic blood pressures of the subjects were measured using the ausculatory method with aneroid sphygmomanometer as described by Pickering et al. The blood pressure measurements of the subjects were taken twice, and the average was recorded as the subject's blood pressure. Four milliliters of fasting blood samples was collected from all subjects, 2 mL of blood was dispensed into K2-EDTA vacutainer tube for blood lead analysis, and the other 2 mL was dispensed into plain vacutainer tube, allowed to retract, spun at 3000 revolutions per minute for 5 min, and the serum was used for serum lipid profile assay. Blood lead (BPb) level was measured using Varian AA240 Atomic Absorption Spectrophotometer according to the method described by the American Public Health Association. Serum total cholesterol (TC) was determined by enzymatic colorimetric method as described by Grove. Serum triglyceride (TG) was estimated by enzymatic colorimetric reaction according to the method described by Fossati and Recipe; low-density lipoprotein cholesterol (LDL-C), and very low-density lipoprotein cholesterol (VLDL-C) were calculated based on Friedewald's formula. Statistical Package for Social Sciences (SPSS) version 20.0 was used for statistical analysis. The variables are expressed as mean ± standard deviation. Independent Student's t-test was used to calculate the difference between two independent variables, and Pearson's correlation coefficient was used to assess the level of association between two variables. The level of significance was considered at P < 0.05. In [Table 1], both the systolic and diastolic blood pressures were significantly (P < 0.05) higher in the automechanics compared with the controls. In [Table 2], data indicate a significantly (P < 0.05) higher blood lead level in the automechanics compared with the controls. Serum levels of TC, LDL-C, VLDL-C, and TG were also significantly (P < 0.05) higher in the automechanics compared with the controls. However, serum high-density lipoprotein cholesterol (HDL-C) level did not differ significantly (P > 0.05) between the two groups. 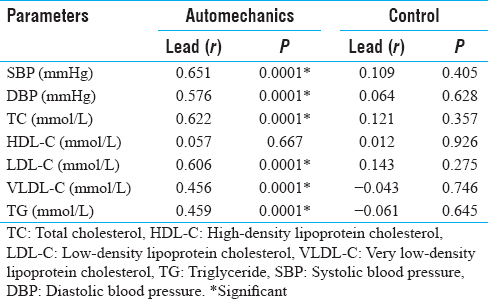 In [Table 3], blood lead showed a significant positive correlation with SBP, DBP, serum TC, LDL-C, VLDL-C, and TG (P < 0.05), with no significant correlation with serum HDL-C (P > 0.05) in the automechanics and no correlation in the controls (P > 0.05). Lead is a toxic metal which is ubiquitous in nature and plays a major role in the development and progression of atherosclerosis and cardiovascular diseases. Our study observed higher values of both systolic and diastolic blood pressures in the automechanics which may be associated with the nephrotoxic effect of lead which indirectly affects blood pressure. The subsequent alterations in tubular function could lead to salt retention and volume overload, eventually resulting in elevated blood pressure. On the other hand, lead may in addition cause a direct effect on vascular smooth muscles or central/peripheral nervous system. In addition, lead may alter the renin angiotensin system through the activation of angiotensin converting enzyme, or as a result of lead-induced oxidative stress which enhances the production of reactive oxygen species, thus limiting the availability of nitric oxide, and consequently enhancing vascular contraction and endothelial dysfunction. These findings support earlier studies which reported that lead exposure is a significant risk factor for the development of hypertension., Contrary to these findings, Ajani et al. observed no differences in the systolic and diastolic blood pressures in automobile mechanics and the control population. This study further observed a direct relationship between the blood metal levels and blood pressure (systolic and diastolic), and these correspond with the reports of Kasperczyk et al., Alghasham et al., and Lee et al., who also reported a direct relationship between blood lead levels and blood pressures. However, An et al. in their study on workers of smelting industry reported a positive relationship between blood lead and blood pressure which could be as a result of the low blood lead levels (<7 μg/dL) recorded in these workers. Blood lead measurement has been used as a reliable marker of recent exposure to this toxic metal, and the elevated blood lead level in the automechanics observed in this study indicates that these groups of workers are more exposed to these metals than the general population because they come in contact with these metals in their daily activities at their various workshops. These findings correspond with those of Ahmad et al. and Alli who also reported similar increase in blood lead levels in subjects occupationally exposed to this toxic metal. In addition to the increased blood lead level observed in the occupationally exposed, the study also observed that the blood lead level in the occupationally unexposed subjects was higher than the World Health Organization–permissible range of <10 μg/dL of lead in adults. The increase in the blood lead level observed in the nonoccupationally exposed subjects could be from other environmental contamination and exposures including inhalation of exhaust fumes or contaminated dust particles or inadvertent ingestion of contaminated foods or drinks which is a possible indication of the extent of lead pollution in Nigeria. This is of serious concern as many Nigerians may be exposed to lead from the environment irrespective of their occupations. Similarly, Orisakwe and Galadima and Garba also reported a high blood lead level in nonoccupationally exposed subjects. These findings support the fact that lead is a generally recognized occupational and environmental pollutant. This study also observed significant elevations in the serum levels of TC, LDL-C, VLDL-C, and TG with no significant change in HDL-C level in the automechanics, and this may be attributed to the adverse effect of lead on lipid metabolism possibly by altering normal lipid and lipoprotein fractions through lipid peroxidation. It may also be attributed to the upregulation of plasma cholesterol and TG concentrations by this toxic metal, and these alterations in cholesterol metabolism increase the risk of cardiovascular diseases in subjects exposed to this metal. Toxic metals probably enhance the activity of 3-hydoxy-3-methylglutaryl coenzyme A (HMG CoA) reductase which is the rate-limiting enzyme in cholesterol biosynthesis thereby enhancing cholesterol synthesis. Other researchers had earlier reported cases of dyslipidemia in both humans and animals exposed to lead., Studies on exposure to lead have demonstrated similar increase in TC, LDL-C, and TG levels as well as decreased HDL-C level in animal, Human studies also reported a similar increase in TC, LDL-C, and VLDL-C levels, elevated TG level (Ajani et al., 2011), and normal levels of HDL-C. Adejumo et al., however, observed a low serum HDL-C level in automobile mechanics and spray painters. This study further observed a direct relationship between blood lead and TC, LDL-C, VLDL-C, and TG, with no significant association with HDL-C in the automechanics. Sharmar et al. also observed a similar association between blood lead and TC and LDL-C. The results of this study indicate that blood pressure is elevated and lipid profile altered in automechanics which suggest that these groups of workers are prone to increased risk of developing hypertension and cardiovascular disorders due to occupational exposure to lead. Khan AA, Safeena I, Idrees M, Dad A, Gul K, Akbar H. Effect of automobile workshop on the health status of automechanics in N.W.F.P, Pakistan. Afr J Environ Sci Technol 2010;4:192. Lovei M. Proceedings of the international conference on lead poisoning prevention and treatment. In: George AM, editor. Eliminating a Silent Threat: World Bank Support for the Global Phase-Out of Lead from Gasoline. Bangalore: The George Foundation; 1999. p. 169-80. Osterode W, Ulberth F. Increased concentration of arachidonic acid in erythrocyte membranes in chronically lead-exposed men. J Toxicol Environ Health A 2000;59:87-95. Bhattacharjee CR, Dey S, Goswami P. Protective role of ascorbic acid against lead toxicity in blood of albino mice as revealed by metal uptake, lipid profiles, and ultrastructural features of erythrocytes. Bull Environ Contam Toxicol 2003;70:1189-96. Glew RH, Kassam HA, Bhanji RA, Okorodudu A, VanderJagt DJ. Serum lipid profiles and risk of cardiovascular disease in three different male populations in Northern Nigeria. J Health Popul Nutr 2002;20:166-74. Ademuyiwa O, Ugbaja RN, Idumebor F, Adebawo O. Plasma lipid profiles and risk of cardiovascular disease in occupational lead exposure in Abeokuta, Nigeria. Lipids Health Dis 2005;4:19. Ugbaja RN, Onunkwo BO, Omoniyi DA. Lead induced dyslipidemia: The comparative effects of ascorbate and chelation therapy. Afr J Biotechnol 2013;12(15):1845-52. Pickering TG, Hall JE, Appel LJ, Falkner BE, Graves J, Hill MN, et al. Recommendations for blood pressure measurement in humans and experimental animals: Part 1: Blood pressure measurement in humans: A statement for professionals from the subcommittee of professional and public education of the American Heart Association council on high blood pressure research. Circulation 2005;111:697-716. American Public Health Association. Direct Air-Acetylene Flame Method Standard Methods for the Examination of Metals in Blood. 20th ed. Washington: American Public Health Association; 1995. Grove TH. Effect of reagent pH on determination of high-density lipoprotein cholesterol by precipitation with sodium phosphotungstate-magnesium. Clin Chem 1979;25:560-4. Fossati P, Prencipe L. Serum triglycerides determined colorimetrically with an enzyme that produces hydrogen peroxide. Clin Chem 1982;28:2077-80. Satarug S, Nishijo M, Lasker JM, Edwards RJ, Moore MR. Kidney dysfunction and hypertension: Role for cadmium, p450 and heme oxygenases? Tohoku J Exp Med 2006;208:179-202. Hertz-Picciotto I, Croft J. Review of the relation between blood lead and blood pressure. Epidemiol Rev 1993;15:352-73. Simões MR, Ribeiro Júnior RF, Vescovi MV, de Jesus HC, Padilha AS, Stefanon I, et al. Acute lead exposure increases arterial pressure: Role of the renin-angiotensin system. PLoS One 2011;6:e18730. Pierini D, Bryan NS. Nitric oxide availability as a marker of oxidative stress. Methods Mol Biol 2015;1208:63-71. Virdis A, Duranti E, Taddei S. Oxidative stress and vascular damage in hypertension: Role of angiotensin II. Int J Hypertens 2011;2011:916310. Tsao DA, Yu HS, Cheng JT, Ho CK, Chang HR. The change of beta adrenergic system in lead-induced hypertension. Toxicol Appl Pharmacol 2000;50:31-7. Dongre NN, Suryakar AN, Patil AJ. Biochemical effects of occupational lead exposure to workers in small scale automobile workshops of North Karnataka (India). J Environ Health Res 2010;10:27-4. Ajani EO, Ajibola A, Salau BA, Odufuwa TK, Odewabi AO. Preliminary report on hepatic and cardiovascular risk assessment of automobile mechanics in Nigeria. Afr J Biotech 2011;10:1705-11. Kasperczyk S, Kasperczyk J, Ostałowska A, Zalejska-Fiolka J, Wielkoszyński T, Swietochowska E, et al. The role of the antioxidant enzymes in erythrocytes in the development of arterial hypertension among humans exposed to lead. Biol Trace Elem Res 2009;130:95-106. Alghasham AA, Meki AR, Ismail HA. Association of blood lead level with elevated blood pressure in hypertensive patients. Int J Health Sci (Qassim) 2011;5:17-27. Lee BK, Ahn J, Kim NS, Lee CB, Park J, Kim Y. Association of blood pressure with exposure to lead and cadmium: Analysis of data from the 2008-2013 Korean national health and nutrition examination survey. Biol Trace Elem Res 2016;174:40-51. An HC, Sung JH, Lee J, Sim CS, Kim SH, Kim Y. The association between cadmium and lead exposure and blood pressure among workers of a smelting industry: A cross-sectional study. Ann Occup Environ Med 2017;29:47. Usuda K, Kono K, Ohnishi K, Nakayama S, Sugiura Y, Kitamura Y, et al. Toxicological aspects of cadmium and occupational health activities to prevent workplace exposure in Japan: A narrative review. Toxicol Ind Health 2011;27:225-33. Ahmad SA, Khan MH, Khandker S, Sarwar AF, Yasmin N, Faruquee MH, et al. Blood lead levels and health problems of lead acid battery workers in Bangladesh. ScientificWorldJournal 2014;2014:974104. Alli LA. Blood level of cadmium and lead in occupationally exposed persons in Gwagwalada, Abuja, Nigeria. Interdiscip Toxicol 2015;8:146-50. World Health Organization. Trace Elements in Human Nutrition and Health. Geneva: WHO; 1996. Ugwuja EI, Ogbu IS, Umeaku EA, Otuu FC. Blood lead levels in children attending a tertiary teaching hospital in Enugu, South-Eastern Nigeria. Paediatr Int Child Health 2014;34:216-9. Orisakwe OE. Environmental pollution and blood lead levels in Nigeria: Who is unexposed? Int J Occup Environ Health 2009;15:315-7. Galadima A, Garba ZN. Heavy metal pollution in Nigeria: Causes and consequences. Elixir Pollut 2012;45:7917-22. Pourmand A, Khedir Al-Tiae T, Mazer-Amirshahi M. Perspective on lead toxicity, a comparison between the United States and Iran. Daru 2012;20:70. Zhou J, Kong C, Hou X, Zhang Z, He F. Green tea effects on the levels of serum glucose and lipid profiles. Am J Med Sci Med 2016;4:59-2. Olisekodiaka MJ, Igbeneghu CA, Onuegbu AJ, Oduru R, Lawal AO. Lipid, lipoproteins, total antioxidant status and organ changes in rats administered high doses of cadmium chloride. Med Princ Pract 2012;21:156-9. Samarghandian S, Azimi-Nezhad M, Shabestari MM, Azad FJ, Farkhondeh T, Bafandeh F. Effect of chronic exposure to cadmium on serum lipid, lipoprotein and oxidative stress indices in male rats. Interdiscip Toxicol 2015;8:151-4. Sharmar SV, Kumar P, Atam V, Verma A, Murthy RC. Lipid profiles with increased blood lead levels: Risk of cardiovascular disease in battery workers of Lucknow city. J Indian Acad Forensic Med 2012;34:328-31. Adejumo BI, Osagie I, Dimkpa U, Emmanuel AM. Lipid profile and atherogenic indices of commercial automobile battery recyclers (battery chargers), automobile mechanics and spray painters in Benin city, Edo state, Nigeria. Niger Biomed Sci J 2016;12:39-2.